This very popular dish looks like a cream tea, though a taste of the chilli jam quickly corrects that impression. Cutting the squid in triangles rather than rings helps to keep it moist. Stew the onion and peppers in the olive oil for 5 minutes without allowing them to colour. Add the chillies and continue to sweat the mixture over a very low flame for a further 5 minutes. Add the sugar and tomatoes, season the mixture with salt and pepper and cook gently for 40 minutes until it has a jammy consistency. In one bowl, mix the flour and the salt. In a second bowl, beat together the eggs and milk. Put the breadcrumbs into a third bowl. Next, using one hand for the wet ingredients and the other for the dry, dredge each piece of squid in the seasoned flour, dip it in the egg mixture, then roll it in the breadcrumbs. Lay the squid on sheets of greaseproof paper and keep dry. Using a deep-fat fryer or a large saucepan half-filled with oil, heat the oil to 190°C – the point at which a 2cm cube of bread browns in 25 seconds. Drop in the squid in batches, so that the temperature of the oil doesn't reduce too much, and fry for about 2 minutes until golden brown and crisp: it will cook very quickly. Fill ramekins two-thirds full with crème fraîche and spoon a generous quantity of the chilli jam on top. 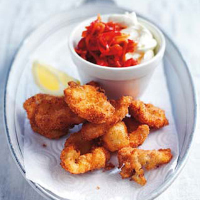 Place each ramekin on a plate covered with a paper napkin and surround with the squid and a few lemon wedges. Serve immediately. Any extra chilli jam can be kept in a sterilised jar in the fridge for 2–3 weeks.